I got a phone call from Jay Allen saying he had an old photo of Goleta he wanted to give me. I was honored and said heck yes, I’d love to see it. The next day, I get an email from Rob Evans. He too had an old photo of Goleta he thought I should have. Weird coincidence, I thought, but cool. I’d love to see it. Weirder still, they were both the same photo! They hadn’t talked to each other, they both just had the same idea, with the same picture, at the same time! So I figured I should find a little out about this shot and share it. So this amazing photo was taken in 1948. This is Hollister Avenue in the foreground, and on the right is Nectarine Street, which turns into Pine Avenue when it crosses Hollister. A lot of these buildings are still there. We broke it down like this, numbering the things we’ve found out about. The circles are around water towers, since this was before Cachuma Dam was built, the water came from wells. Number 1 is a gas station. Lifelong resident Joe Kunze was one of my sources on this. He says it was called the White Spot. Why? He wasn’t sure, it just was. Maybe the owners name was White. Check out the cool sedans and the delivery truck. Classic. Number 2 is a bar. Goleta native Mike Phillips says it was called the Silver Dollar. Pretty classic name. We can see a dude on the left going in for a stiffie. Here’s number 2 today, going strong as Altamiranos. A great Mexican restaurant with killer chicken pozole on the weekends. Number 3 was Crisman’s grocery store. Joe Kunze knows all about this place because he worked here for years. In the back you can see all the storage sheds. This building was demolished some time later. Notice the lady in the left foreground heading in and also the parked car with it’s rumble seat open. Number 4 was a real estate office and a barber shop. Today number 4 is Aquatics dive shop with apartments on top. The arches are gone, but everything else is about the same. Number 5 was called the Camel Auto Court. It was an early version of a motel with a gas station in the front. The rooms were stand alone little buildings, possibly originally used as barracks for the Marine base that was where the airport is now. Remnants of the Camel Auto Court still exist and are being lived in, but where the gas station once stood is now a 7-11. Number 6 is the intersection of Hollister and Nectarine/Pine. Number 7 is this building that was a department store. Mr. Phillips recalls this as being Gray’s. The first place in town to buy Hang Ten shirts. Kind of a big deal for a surf rat. Which still exists and houses several small thriving businesses. Number 8 is still here, providing housing for old town residents. Number 9 was this hotel. Can you make out the name? It looks like Hotel Ellwood maybe. Which would be appropriate because Judy Ensign, another Goleta native, says Ellwood Cooper, a Goleta pioneer, died in this building. Judy would know, because her parents bought part of Cooper’s ranch in the Winchester Canyon and that’s where she grew up. Here it is today, serving as an apartment building. Number 10 was an early location of St. Raphael’s Church. The building was moved to the church’s present location and served as the parish hall for years. Unfortunately it was recently demolished. Thanks to Jay Allen, Rob Evans, Joe Kunze and Judy Ensign. See the actual photo hanging in Santa Cruz Market in Old Town. After we published this page, we got a lot of response and some additional information we thought we should share…. The Old Town location was the 2nd location. The original was on the corner of Hollister and Fairview where Jiffy Lube now is. In 1996, I co-edited a book on a 100 year history of St. Raphael’s and have photos to show original building site with church. It was never used as barracks. I’ve been inside one original bungalow and it has all custom Catalina-style tile and is darling with a full bathroom and mini-kitchen. This was one of the first auto courts but it quickly became long term housing post WWII for young families because there was a severe housing shortage in Goleta before the tracts were built. It was not a barber shop but Mie Ota’s beauty salon where she had clients such as Hollister family members. Mie became known for her fine styling and was popular for decades. Yes, this was called the Hotel Ellwood and the one you have pictured is the second hotel to grace that site. Hotel Ellwood was built with materials from the original hotel at that site in the early 1900s. The glass in some windows is glass from the original hotel. Tom, these are great photos. I remember Joe Kunze working at Cristman’s Market and then Santa Cruz Market. Mije Ota just celebrated her 98th birthday. They had the beauty shop and Aikido/Judo-Ballroom Dance Studio on Magnolia Ave. I grew up in Goleta from ’49-70. 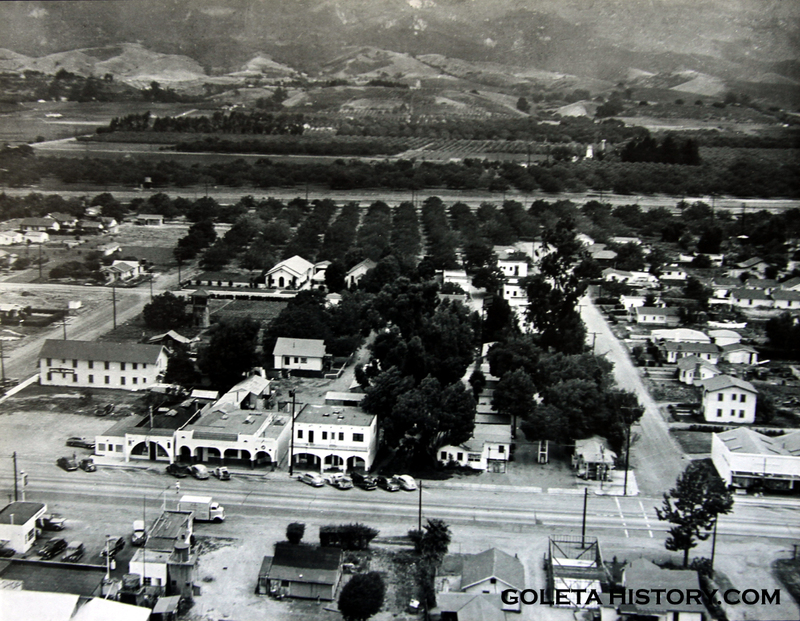 Do you have any pictures of the shops in downtown Goleta from that era other than these? My Uncle, Murray Marcus, owned a strip of shops from Benny’s Liquor to a shoe store. Another Uncle, Si Gilbert, has a photo studio next to the Liquor Store. There was a Men’s Store and Bastian’s Clothing. Further down was a department store, jewelry store, bakery, Post Office. If you have any photos, stories during that time, it would be great to reminisce. Thank you. Thanks Judy, Help me find more photos of Old Town! Joe passed away about a year ago. Thanks for sharing his input. Shirley might have a wealth of information as well. I remember Judy Herzog as a little girl. I worked with Joe Kunze thru out my hugh school and UCSB days. The market was original owned by a man named Lasargig. Oliver Chrismon bought it just after WW II and then sold it to his brother-in-law Willard F. “Smokey” Padgett. Smokey played professional baseball for the St Louis Browns until he went in the service in WW II. The building to the left of the market was then called The Airport Inn. The shop to the right was for years a cobbler shop originally owned by Frank LaLonde. My family goes back in the area when my grandfather was a hoist operator for the asphaultum mine. Hi Tom- thanks for these great images! A real blast from the past! Do you (or anyone else out there in cyberland) know of any photo that has Minnie’s Cafe in it? It was on Hollister in the 1930’s/1940’s, run by Minnie Morrell and Eleanor Newland. I believe the barracks were on the corner of Fairview and Hollister Avenue. There were Quonset huts there. I believe there’s an aerial photograph of Goleta in Domingo’s Cafe. from about 1948, that shows them, where the tire shop is now. Miye Ota did have her beauty shop where the dive shop is now. She moved to the Magnolia Avenue location later. Just wondering if you have any info on the Magnolia Cafe. My grandfather owned it and I have vague memories of visiting there in early 1950’s. Also have two small photos taken with a Kodak Brownie camera.